The Mid-Autumn Festival also known as the Moon Festival or Mooncake Festival, is a popular lunar harvest festival celebrated by Chinese. In Singapore, we usually celebrate with mooncakes and lanterns. I read that in Taiwan, it is common to celebrate by sending each other pineapple cakes and not just mooncakes. 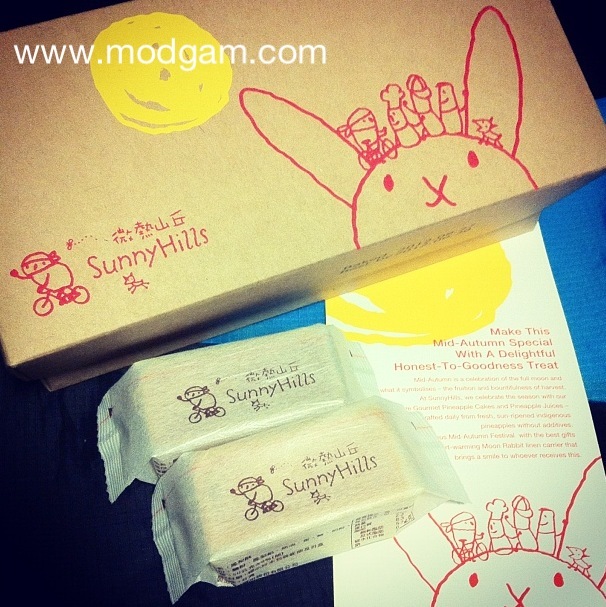 Sunnyhills pineapple cakes from Taiwan are now here at Raffles Hotel Singapore. I understand there are a lot of different pineapple cakes in Taiwan and is a favorite snack/gift. I am not familiar with them till I saw Sunnyhills introduced by another blogger friend of mine. The packaging is so pretty and the cute illustrations caught my attention right away! I receive a bigger surprise after opening the pretty packaging. The big pineapple cakes looking back at me! I literally went ooohhhhh and couldn’t resist putting one into my mouth that I forgot to snap a picture! I will do a detailed blog post this weekend after visiting their store! Many thanks to Damien of Sunnyhills for mailing a box to my crib! I feel happy seeing the handwritten note wishing my family and me a good mid-autumn celebration. Thanks for the sweet gesture Damien. SunnyHills makes the best pineapple cakes! The pineapple filling is made from pineapples native to the area in Taiwan. Yummy!